Can Banks and FinTechs really be partners? Recently, Bank Relevant colleague, Syed Bukhari and I had an opportunity to speak to Alex Jimenez, a leading advisor to banks in the areas of digital banking, payments, innovation and general strategy. We enjoyed a 30-minute conversation with Alex around a whole hosts of topics such as fintech-bank partnership, innovation, the open-banking model, and use of voice assistants in banking. Alex has been named as one of the top 100 global influencers in Financial Technology (FinTech) by Onalytica, Hot Topics and by Jay Palter, as well as in Insurance Technology by Onalytica. He has been featured in the Irish Tech News and in the Independent Community Bankers of America’s (ICBA) Independent Banker. The ICBA named Alex the Indie Banker of the Month, December 2015, for his work in innovation in banking. Alex has been published by The Financial Brand, and the Irish Tech News. He has been quoted in the Wall Street Journal, the Boston Globe, The Financial Brand, the American Banker and the Boston Business Journal. Alex has spoken at various Financial Services conferences including CBA Live 2012–2015, NetFinance 2014, 2015 and 2017, Medios de Pagos LATAM Summit 2013, FIS’s Infoshare 2011 and 2012, BAI Payment Conference 2012, BAI Retail Delivery 2011, and Mobile Banking & Emerging Applications Summit 2011. Syed and I are pleased to share our insightful interview with Alex in long-form. Please note, the views and opinions expressed in this interview are those of the Alex, Syed, and myself only. They do not necessarily reflect the official policies or positions of our respective employers. Examples of analysis performed within this story are only examples. Recently I saw a post on LinkedIn, where the head of Citi Ventures, Vanessa Colella spoke about how Citi Ventures helps FinTech startups grow and navigate the regulatory complexities while working with large banks. I know that as one of the top FinTech voices in North America, you’ve advised startups in the past. 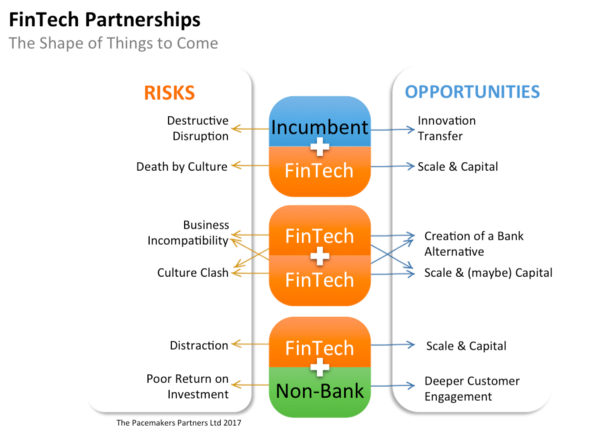 So I was interested in learning, how would you respond to Vanessa or really any large bank executive’s sales pitch on FinTech partnerships, and how would you respond to the comment that incumbent banks actually helped FinTech scale, grow, and navigate? What has been your experience, and what do you see? It all depends on the definition of partnerships. To me, a partnership is something that’s equally beneficial for both parties. 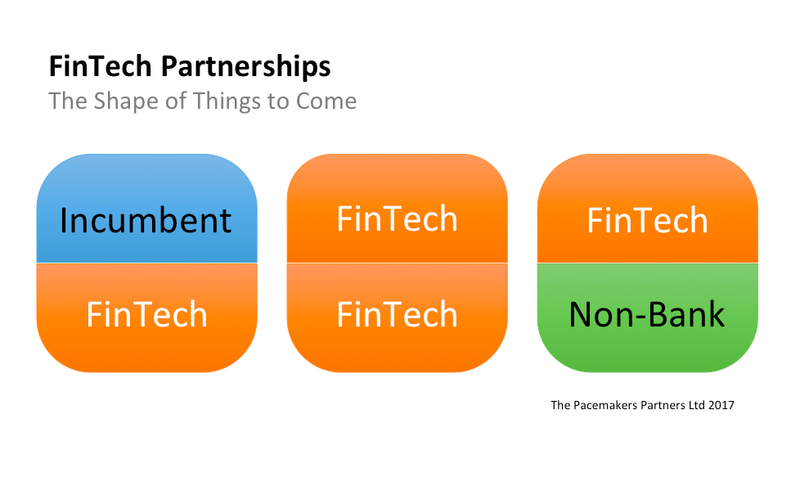 If that is the definition, I don’t see a lot of real partnerships between FinTech companies and banks. Perhaps the exceptions I can think of are the blockchain consortia where a firm like R3 works with a group of banks. The reality is that FinTech companies that work with banks are seen as either vendors, investment opportunities, or targets for acquisition. And yes, all of those can be good relationships. But to me, they’re not partnerships. Banks look to FinTech companies for the technology and innovation they lack. The problem is that they approach them in the same way they’d approach well established companies like FIS or Fiserv. A problem with this approach is that most FinTech startups don’t have the kind of documentation required of a conventional banking vendor. Specifically, I’m talking about things like audited financials that go back three to five years, and ready-made due-diligence packages. This is particularly true of FinTech companies who’ve been selling directly to consumers all along, and now decide to pivot to become a bank service provider. Suddenly they are dealing with an entirely different set of prerequisites to do business with banks. Is it so bad that FinTechs are seen as vendors by banks instead of partners? So if you come with that mindset, that’s a different discussion. When you expect that you’re going to be able to onboard a bank to be using your technology within 30 to 60 days, which is what they thought from a technical standpoint you are going to be hugely disappointed. Instead, expect a lengthy due diligence process, and lengthy contract negotiations and risk reviews. It will take six months at minimum just to get past these formalities before you start actually doing anything material with the bank. So how do we fix that? What can we practically do bank-side? From the bank side, it’s tough because even when you talk to the innovation people at the OCC, for example, they’ll say that they support quicker and alternative approaches to vendor management. But the examiners are still holding banks up to what they’ve always done. So it’s not always easy, but there are some things that banks can do. They can look at the reason why they’re doing a vendor management review and come up with alternative ways to address some of the issues. So my favorite example is the whole idea of having several years of audited financials. You’re not going to get that from a company that’s only been around for a year, and is privately held. So how do you get over that? From a financial review standpoint, people have invested in the company. They believe that there is a good idea here, and they are likely to invest further in the company. So how about saying, “Okay you don’t have the financials, but you can show me the financials that you have. How about you allow me to go to your VCs?” That would be a way to address part of that. A couple years ago I talked to a bank who indicated that this was indeed their approach. Their thinking was, “we would look at a FinTech’s financials as if they were one of our commercial banking customers. We are going to talk to their investors, and take them through a similar process as we do when we underwrite a commercial loan for customers of their type.” Of course, this approach works best for banks accustomed to lending to startups or similar clients. The point is, finding a reasonable alternative to traditional due diligence. Banks need an open mind when dealing with FinTech firms. Instead of blindly asking for documents such as five-year financials, think about why you’re asking for those documents, and what is that document driving to? So, if you are an innovation-focused bank, you could build a vendor-management-lite or vendor management for FinTech process that is flexible but still secure and quicker In fact, once you become comfortable with it, you might be able to use it for all vendors. Perhaps banks have to be innovative with their vendor management processes before they can be innovative like FinTech companies. The bank’s innovation may actually need to start with their vendor-management or risk-management as opposed to looking at matching a FinTech’s customer experience. Banks aren’t going to get there with the conventional processes they have. Bank’s need to be swift, innovative, and agile in their ways of doing business before they can deliver innovation by partnering with FinTechs. It’s interesting, Pari and I do a lot of work right now in design-led and experience-led transformation. We haven’t yet had an engagement where a desired outcome was to enable innovation in the compliance or risk management. Never. Instead, many of people we engaged with at these institutions preferred to sidestep risk-management and compliance. However, risk-management and compliance are important functions. So, what are some of the ways that we could engage with those roles? How do we engage with vendor-management and risk-management folks in a way that is non-threatening? To me, one of the interesting things is that everybody wants to be part of the innovation experience, and that includes the folks in risk, legal, and security. But they’re never asked. They’re never included. They’re never thought of. Certainly, some companies do that. But the majority don’t. In my experience, I’ve had some really fantastic, very innovative, very out-of-the-box kind of folks who entirely came from a compliance standpoint and they were very interested and excited, and actually more knowledgeable than some of the bankers on what were the trends in the industry. A few years ago, I worked with some compliance folks at a bank who were some of the only people in the bank who actually knew what was going on in marketplace lending, wealth management, robo-advisors and so on. So to me, my approach was always: start with them and try to figure out what are the things that we need to do to lineup a project or an idea correctly, so we don’t have to undergo redo work. That has always worked well for me. It also helped that my office was right next to the head of compliance. Hahaha. That’s actually a good point — being co-located with risk-management folks and co-creating with them early-on. I don’t think I’ve heard anyone say that. That’s really cool. Let’s adapt our vendor management processes so that way we can actually take advantage of some of the innovation that’s out there, rather than talk about it. Does open-banking encourage banks to update their worldview on how they interact with FinTech companies? For example, the access-to-account rule for the Revised Payment Service Directive (PSD2) in Europe? Maybe, except that I think that the chances of something like PSD2 happening in the US are very, very small. Just looking at what we see now in the EU, the large majority of banking customers seem to not understand what it’s all about. They don’t seem to understand what open-banking is. If that experiment doesn’t work, then there’s no chance it’s going to get here. Also, there’s a conflict between open-banking and current regulations in the US. To hold banks responsible for implementing open-banking and at the same time enforce the kind of privacy regulations that we have to function under is ridiculous. This is because it is entirely contradictory. I speculate that the bank-FinTech interactions will not change. Especially, when I consider Europe where open-banking is happening now. I think that the big boys in the UK, for example, are still looking at FinTech companies as vendors and not partners. Let’s talk a little bit about the future. What will be the future of innovation in banking look like? Banks need to simplify, simplify, simplify. Generally most U.S. banks, even the smaller ones offer too many products and too many choices. Often there’s really no difference between checking one and checking two and checking three products. Right? A lot of times we just have built terrible, terrible product portfolios. Some of these portfolios are just mind-boggling, and to expect customers who already are buying a product they’re not entirely excited to look at the minutia and compare five or six different checking accounts is insane. Banks really need to focus on who their target customers are, also try to figure out what it is that they do well. The whole idea of understanding your core competency is what’s going to drive this semi open-banking world in the future. I find the idea of the bank-as-a platform interesting. This is where the consumer has a relationship with their bank and trusts the bank with managing their financial data. In return, the bank extends their services by having partnerships with other third-party organizations to provide a more richer set of services sought by the consumer. This is somewhat like open-banking. Except that I think in the US it’s going to be more of a marketplace. We are already starting to see this with banks like Capital One who have published their APIs; where Fintech firms can go out, download those APIs, and develop around that to offer more relevant services to Cap One customers. I believe that such a model is going to be where banks will go to in the future. Banks will be that trusted identity-management organization that’s going to provide the consumer with certain financial products. Extended products and services will be provided by FinTech companies or even other banks. This is where I think retail banking is headed. Interesting. So first of all, Syed, you probably see a lot of parallels to what Spencer Jones said in our the future of retail banking interview with him the other day. Alex, what unique capability could banks provide in the semi open-banking model? To begin with, I think the identity management, the KYC, leveraging the trust that we established with the consumer. Despite what happened almost 10 years ago now, people are continuing to trust their banks and credit unions with their financial information. Banks need to leverage this trust as a way to continue to be relevant. Certainly, people are less trusting of Facebook, for example. More will trust the bank, as long as banks can continue to keep that trust and continue to provide security. Furthermore, many FinTech companies want to collaborate with banks because they have been able to gather somewhat of a market but not enough to scale. To get to a larger market, some FinTechs are having a hard time competing against banks, particularly bigger banks. That’s why FinTechs are turning to banks to partner with. To me, that shows you that, at least in the US, the customer-base of the bank is something that banks need to continue to defend, leverage, and use to move forward. What happens to the mid-tier banks or even smaller banks in this model? Is there a viable future for them? Maybe. But, I think in the next few years we’re going to start seeing more and more M&As again. We still have roughly 6,000 banks and 6,000 credit unions in the US. That is significantly higher than the number of institutions in the UK, Europe or Australia, for example. The big difference with the U.S. is that we’re a big country geographically, and many people prefer to do business with local companies or regional companies. So there’s a place for small and medium-sized local institutions. But, I think that numbers going to diminish. There are plenty of banks out there that are just not keeping up with technology. The bigger banks are the ones that are acquiring more share of the customers. Generally, those are younger folks. Older folks have a trusted bank or set of banks that they do business with. The ones that are really at play are the younger people who are opening new accounts, who are just coming into the market. Generally, the community banks and medium-sized banks don’t make it to the very short list of banks that the younger population is going to do business with. So, I think there’s going to be a squeeze there between the big banks and the small banks, and there will be a smaller number of banks and credit unions in the future. Pari and I were having an esoteric conversation the other day about how certain industries, certain other business have a visceral, emotional connection to consumers. He was arguing that the banking experience today really lacks that. Do we as bankers have a responsibility to try and make the customer experience more emotionally intelligent and connected? Right, yeah I’m actually going to give you an example that’s outside of banking in an even more boring industry: insurance. I’m a huge fan of Progressive, and why I am such a huge fan is because everything I do with them is so easy. It’s because they focus on the experience. Certainly, there are others that do better. I’m sure that if I were to look at Lemonade, who’s one of the insurtech companies out there, that they will be even better than that. My experience with Progressive compared to other insurance companies I’ve had in the past is that their experience is just phenomenal. Recently, someone backed into my car when it was parked in front of my house, and they were very nice and said: “We’re sorry, but we just drove into your car.” I went outside, and we exchanged insurance data. I took a photograph with my phone, uploaded it to the app, and within 20 minutes, I had the claim open, and the process could not have been any easier. That’s been my experience with Progressive. I have almost all of my insurance with Progressive because of it. If banks did a good job of giving you good experiences, you would have raving fans, and you do. If you talk to a USAA customer, insurance or banking or both, these people generally are very, very excited about the financial products they have, and it’s because the experience with USAA is top-notch. Sometimes I feel like that USAA is kind of an unfair comparison. Sure it is! I agree that it is an unfair example, but it’s a real example. I have bank accounts or credit cards with various organizations, and very few of them “wow” me with the experience that I have anywhere. I have an account with Simple Bank, part of BBVA, and they really are great, and the experience of banking with them is really, really good. But yet, it has not been good enough for me to move my regular operating account over to them. The reason for that is they’re slightly better than where I am now, and it’s just not good enough for me to move and make all the changes that I need to make to go to them because it’s a pain to change banks. Similarly, people are going to say “There is is no way I’m going to move my bank account from this bank to the other bank. I don’t care what they do, I’m just not going to do that simply because the experience is so great.” From the banking standpoint, there’s still a ton of people who want to bank locally, who wants to walk into a branch, and we’re not doing anything to improve the branch experience. We’re also not doing a heck of a lot to improve the call center experience; we’re just spending a lot of money on mobile to try to keep up with the best mobile apps out there as an industry. Certainly, there are pockets, but we’re just not spending a lot of time looking at what is it that a customer wants to do at a branch and how can we improve that. Instead, what we get is banks saying we’re going to copy Apple and have a branch that looks just like an Apple store. I don’t know when was the last time you went to an Apple store, but the experience of Apple store is terrible so why would we want to copy that? I don’t get that. Now that Amazon has managed to create this awesome eCommerce experience, they are now focused on recreating the physical experience. Banks have the physical infrastructure right now, or certainly the capability to redesign it. However, I don’t see a focus on reimagining the physical experience. Is this is a mistake? So could you just describe what an opti-channel experience is and how that is different from an omnichannel? All right, the difference between omnichannel and opti-channel would largely be semantics. Opti channel is the idea that customer chooses the optimal channel that they’re using for where they are. So if I am walking by a branch and I happen to have a thought about something that I need to do, it might be easier for me to just walk right into the branch and have a conversation. Instead of walking by the branch and then remembering later to call somebody at the bank on my mobile and have a discussion with a banker. I may prefer the mobile channel, but just because I happened to be walking by a branch, I used that. So, the idea of opti-channel is that the customer chooses what channel is optimal for where they are at the moment, whether that be physically or mentally or in their life. So, you should be able to meet them on any of those channels. It sounds like what you’re saying is that context also drives the channel; not necessarily just the consumer’s preference to use a particular channel. Voice assistants: The shiny new toy? How do you define a great customer experience? I think that depends, but efficient, easy experiences where you don’t have to do the extra steps. Recently, a lot of people in the industry are talking about the voice channel meaning Alexa, Siri, and so on as being optimal and better than a screen. But, I do not think the experience is fantastic. For example, if I have to explain something to Alexa with very specific commands that I may not remember, and I have to repeat it four or five different times, that’s not a great experience. This is one of the problems I have with the voice channel right now. Alexa and Siri are getting better, but it’s not responding as easily as it should in many ways. It also might be easier for me to actually type something into my phone than to say something to my phone for something to happen. Does that answer the question? Yes, it does. Thanks a lot for this insightful conversation. Syed Bukhari: Syed is a former Gartner, PwC, and JPMC executive who advises leaders at top 20 retail banks about experience-led digital transformation and innovation. He’s passionate about consulting and uses all his God-given wit, grit, and personality to make his clients look good and achieve success. When he’s not on a plane or at an airport, he helps his wife with her pet travel startup called SnubStub and reads a lot about child psychology and early education. Connect with him on Linkedin. Pari Bose: When Pari is not being a father of two very busy daughters, and trying to get his resting heart rate below sixty, he manages to dabble a bit in digital banking and payments. A resident of the beautiful town of Fair Haven on the New Jersey Shore, Pari draws upon his product management and operations background in banking to take ownership of strategic directions and operations of digital customer experiences for banks and credit unions. Cathy Heckler: Greater Philly area bank-marketing and product management virtuoso, Cathy Heckler remains fascinated by the daily changes in banking and technology and the implications and opportunities that presents to do really interesting work. Copyright 2018 Syed Bukhari and Pari Bose. All rights reserved.